I stepped outside early this morning, and felt a cool breeze coming from the East. The cool air was coming off of my favorite lake, Lake Michigan. Even though we only live 10 miles away, we rarely see the lake. But it makes its presence known, whether it’s by refreshing breezes or lake effect snow. Lake Michigan usually plays a large part in our summer plans. We love to spend a week on the beach, just lounging, sitting in the sun and reading. The sun is hot, the water is cool, and the beach is sandy. But why stop with Lake Michigan? 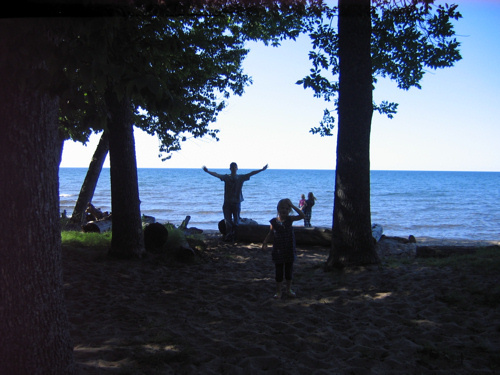 A few summers ago we drove up to Lake Superior. It is so beautiful way up north! Crystal clear water let me see the wave-smoothed rocks lying on the bottom where I gingerly waded. But I couldn’t stay in the water for long…my legs turned numb from the cold! We made it up north, to Lake Superior! 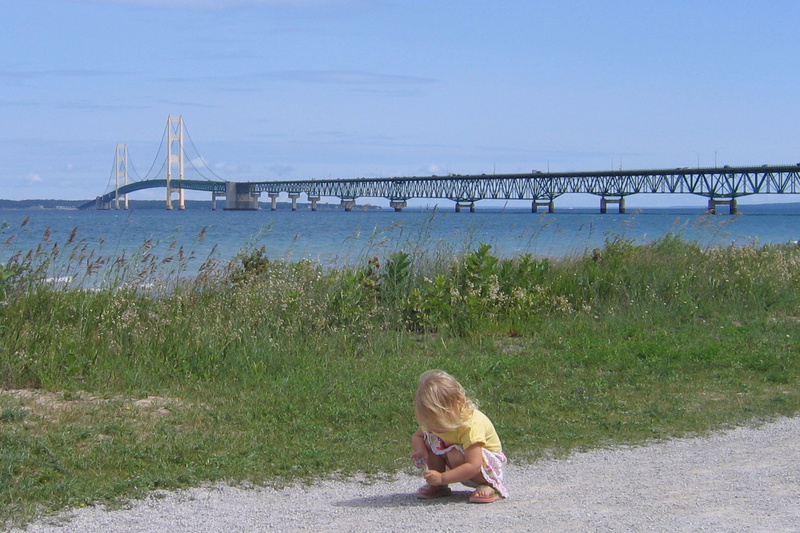 Growing up, however, Lake Huron was the lake to be. We drove up to the tip of the thumb of Michigan and rented a cabin for the week every summer, except for the year my mom was expecting my baby sister. Let’s not forget our HOMES: Huron, Ontario, Michigan, Erie and Superior. What of Lake Ontario and Lake Erie? 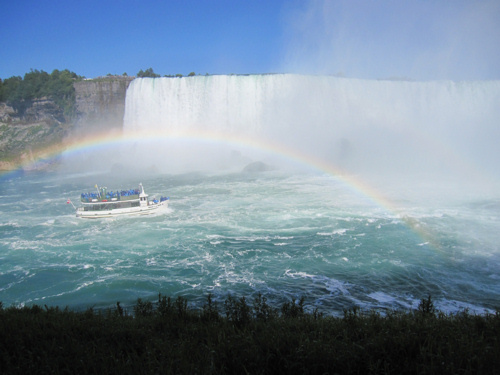 I haven’t spent much time on either shore, but last summer we did spend time at Niagara Falls, which is between Ontario and Erie. Oh, the Great Lakes! They are my favorite places to spend summer! Click on the button above to read more favorites! I was looking for blogs about Union Pier to share on our site and I came across your post…If you're open to it, shoot me an email at jane(at)dwellable(dot)com. Fabulous photographs…love that bridge! Thanks for sharing a place I'd never experienced, Ginny! Lake Superior is one of my absolute favorite destinations. Hubby and I go there whenever we can, which isn't often enough. It's exactly as its name implies – superior. Thanks for the lovely photos. Hope you get to spend lots of time at the lake this summer. My recent post LympheDIVAs – Medically Correct Fashion for Lymphedema, A Product Review &amp; Giveaway! Lake Michigan is beautiful. We always went to Union Pier beach in Michigan when I was growing up. 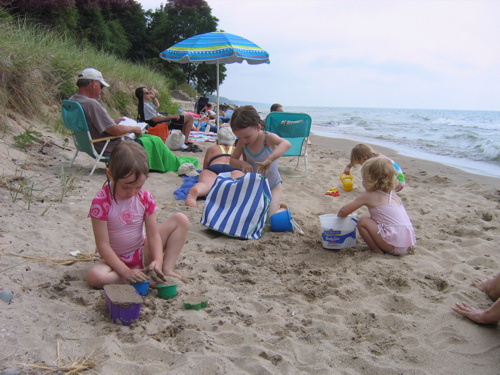 As a High School student we always went to the Michigan Dunes or Indiana Dunes. I have spent a few times at Oak Street Beach also. I haven't seen all of those lakes. I want to be there! I am sad to say that I have never been to a Great Lake. I have flown over them, but that's as close as I've been. I guess I need to add it to my bucket list. If I had a bucket list.